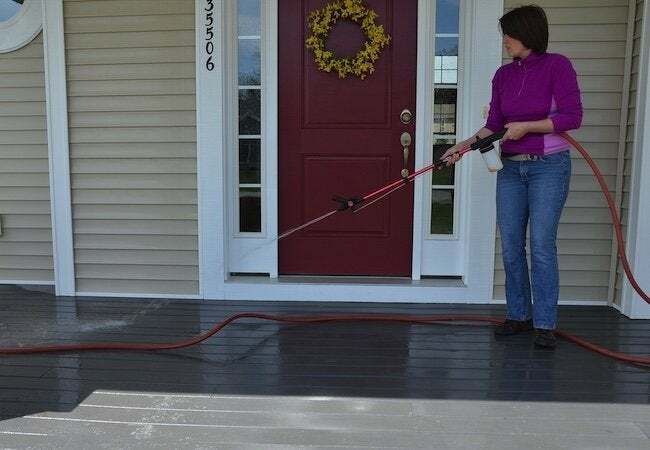 Wash away a winter's worth of dirt and debris with a practical, versatile tool that attaches to your garden hose and lets you both soap up and scrub down grimy surfaces all around your house. Here’s what the real estate agent doesn’t say: Owning a home near the ocean is rarely a day at the beach. Salt air puts vulnerable components to the test, and thanks to frequent strong winds, all manner of dust and debris gets whipped against the home’s exterior surfaces. That’s why our spring cleaning routine tends to focus as much on outdoor decking and house siding as it does on things like forgotten closet shelves and the neglected hardwood floors beneath heavy furniture. Although there’s a fully exposed deck in our backyard, the covered front porch typically takes more of a beating due to its orientation toward the sea. Here, the floorboards are made of a composite material touted for its low maintenance requirements. In my experience, composite may need less upkeep than natural wood does, but it calls out for at least yearly attention, particularly in our neck of the woods. When we clean the porch, our goal is not only to refresh its look, but also to discourage the growth of mildew, an unsightly, damaging menace that always looms threateningly in the background around here. Our usual tools for the task are a humble assortment of buckets, brushes, and garden hoses. But this year, we took things up a notch by trying out the new HYDE PivotPro Outdoor Cleaning Water Wand. PivotPro fits onto your garden hose and gives you more concentrated power from your garden hose. As with some other quality hose nozzles and wands, you’re able to obtain more pressure by forcing the water through a constricted nozzle. But PivotPro surpasses others with the patented feature for which it’s (presumably) named. By pushing or pulling a grip on the barrel of the tool, you can rotate—or pivot, if you will—the spray along a radius of 135 degrees. So without bending or stretching, you can attack grit and grime from every angle. The PivotPro Outdoor Cleaning Water Wand Kit includes a built-in scrub brush as well as a spindle brush. While the oversize scrub brush works well for flat surfaces, such as my porch floor, the spindle brush lets you clean narrow crevices where even hands can’t easily fit. I used the spindle brush on my porch rail, both along the top and up and down the balusters, and I must admit that that’s probably the most attention those unsung heroes of the porch have ever received in my career as the home’s owner. The other feature that distinguishes PivotPro is its integral 16-ounce mixing reservoir. Here, you can pour in your chosen liquid cleanser and, at the push of a button, set the tool to spray soapy water at one of six preconfigured soap-to-water ratios. In years past, we applied deck-cleaning solution first, then followed up separately with a scrub and a rinse. Today, armed with PivotPro, we were able to do all three at once. After adding deck cleaner to the reservoir, I set the soap-to-water ratio I wanted, then got to work spraying soapy water even as I scrubbed. The combination of a powerful spray, crud-cutting soap, and the stiff-bristle brush worked wonders to eliminate the muck that hadn’t seemed like it was going to budge. To finish, I moved the bristle brush out of the way, disengaged the soap dispenser, and rinsed with clear water. Clean! It’s well worth noting that PivotPro accepts not only its own attachments, but a range of third-party components as well. That’s encouraging, because as much as I love my garden-watering hose attachment, it’s not perfect. This summer, I hope to hook it up to the PivotPro, a tool that, at 46 inches in length, would certainly help me reach those flower-filled baskets that I always hang but usually can’t water without a stepladder. I’m also really looking forward to using the HYDE PivotPro Boat/Auto Cleaning Water Wand, because after those last few weeks of winter, my poor station wagon would surely benefit from a bit of—no, a ton of—TLC! For the time being, though, now that the porch is sparkling, I can’t wait to sit out in the morning with a cup of tea, reading the newspaper as the sun comes out.